The 25-year-old scored 27 goals in 41 appearances for the Stark’s Park club this term. Dundee United have signed Brian Graham from Raith Rovers on a two-year deal. 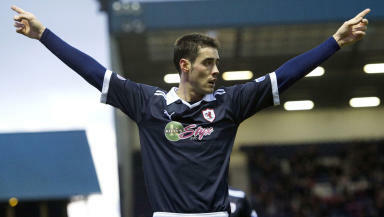 Graham’s contract at Stark’s Park was up in the summer and he has opted to join Jackie McNamara’s men. The 25-year-old hit 27 goals in 41 appearances this season with 18 goals coming in the league. The striker was unveiled to the Tannadice crowd at half-time during the club’s game with Celtic. Graham’s arrival comes after McNamara confirmed club captain Jon Daly would be leaving Tayside this summer. United have already signed Partick Thistle duo Paul Paton and Chris Erskine this summer.